On March 31,1994, singer and guitarist Kurt Cobain, frontman for Nirvana and heralded as the spokesman for a generation, escaped from a drug treatment facility in Los Angeles. Eight days later, as rumors of Nirvana’s breakup spread after it was announced the band had pulled out of that year’s Lollapalooza Music Festival, Cobain was found dead in the greenhouse beside his Seattle home by an electrician installing a security system. The very same day the body was found, police ruled the death a suicide: Cobain had suffered a gunshot wound to the head and was found clutching a shotgun. In the years since, this official explanation has been questioned by fans, investigators, and the general public, leading to a number of “conspiracy theories” relating to Cobain’s death. Covering much of the same ground as Nick Broomfield’s 1998 documentary Kurt & Courtney, director Benjamin Statler’s 2015 film Soaked in Bleach tackles these various theories by telling the story of private investigator Tom Grant, who was hired by Cobain’s wife Courtney Love in early April 1994 to investigate her husband. Initially hired to trace credit card records, Grant eventually became embroiled in a full-on search for Cobain, whose whereabouts were unknown. As might be expected, the detective’s work changed substantially when Cobain was found dead: unsatisfied with the official police explanation and suspecting foul play may have been involved, Grant proceeded to piece together a scenario in which Love appeared to have had more to do with the death of her husband than she was letting on. For its first half, the gloomy Soaked in Bleach presents a timeline of events, from the time Grant was hired by Love up until the day Cobain’s body was discovered. Narrated by Grant himself, the film makes use of dramatic recreations to tell its story and is punctuated by actual audio recordings made during and for the purpose of the investigation. Around the halfway point however, Statler’s film abandons the more “movie-like,” straight-forward and chronological approach and transitions into a more obvious “unsolved mystery” sort of format. Similar to any number of made-for-TV conspiracy documentaries (particularly those involving the death of JFK), Soaked in Bleach unleashes a series of segments introduced by title cards in which talking heads proceed to point out the inherent flaws in the official police investigation of Cobain’s death and insinuate that Love may have been responsible for her husband’s death. Unsurprisingly, this section lacks comprehensive analysis - writer/director Statler simply piles on supposed “evidence” with only one side of the argument ever being presented – and a reenactment of Cobain’s final days pops up as the awkward denouement of the detailed and intriguing but unfocused argument. The acting in the reenactments mainly serves to reinforce the viewpoints of writer/director Statler and Grant himself – Grant is played during these segments by Daniel Roebuck, and comes across as the stereotypical upstanding detective who falls victim to manipulation by virtually every other character he encounters. Courtney Love (played by Sarah Scott) is presented as the ringleader of this manipulation, and comes across as being almost completely reprehensible – a conniving gold-digger with a remarkable ability to spin any situation so that she winds up on top. August Emerson fares little better playing Dylan Carlson, driving force behind the band Earth and Cobain’s best friend, who actually purchased the gun found in Cobain’s death clutch. Carlson appears in the film as a sort of drugged-out zombie, and Statler almost seems to point the finger of blame his way on occasion. While I found the acting to be fairly effective (at least in accomplishing the goals of the production), the reenactments only made Soaked in Bleach itself seem manipulative and questionable in terms of its motives. 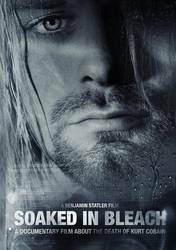 Aside from presuming that a viewer has a working knowledge of Kurt Cobain going in (there’s virtually no examination of the man’s life as a whole), Soaked in Bleach downplays the credibility and accuracy of the official explanation regarding Cobain’s death from the start, going quite a long way in making Courtney Love out to be an accessory to her husband’s murder. According to the film (and arguably, facts), the increasingly disgruntled Cobain was fed up with all the media attention surrounding him and was planning not only to dismantle Nirvana, but also leave the music industry - as well as his wife. Obviously, if this divorce went through, Love would have missed out on her share of the Nirvana legacy – indisputably, she had plenty to gain by killing her husband, particularly if rumors of their impending separation are to be believed. Since none of the “other side” of the story is presented here, Soaked in Bleach exists primarily for the benefit of conspiracy theorists, and would likely only reinforce the opinion that they already have. A more skeptical viewer – or one inclined to accept the official explanation – would likely walk away from this film simply with the idea that it’s now virtually impossible to separate fact from fiction with regard to this case. Over the years, the sheer amount of speculation about Cobain’s death has ensured that virtually everyone has a preconception about what actually happened, making the underlying truth of the situation ever more elusive. Ironic then that a substantial part of Soaked in Bleach deals with “media misinformation” - films like this very one have only obscured the facts further as they pursue their own agendas. Personally, I do find Tom Grant to be credible and believe that there are numerous unanswered questions relating to the Cobain case, but simply buying everything put forth here as absolute fact doesn’t strike me as an altogether responsible thing to do. Certainly, Soaked in Bleach makes a strong case for making the official police reports public but, considering that the controversy surrounding Cobain’s demise only fuels fascination with him, it seems very unlikely that these records will ever be released for scrutiny. The troubled rockstar persona has served Cobain well over the years, so why would the Nirvana estate – one raking in significant amounts of money even now - risk fouling up the mystique surrounding Kurt by seeking hard answers relating to his death? In the end, enjoyment of this documentary (which perhaps would more accurately be described as a docudrama) depends on the viewer’s willingness to believe the conspiracy theory that’s put forth in it. I’d call it a worthwhile, thought-provoking film that’s technically well-made, but one that, like many supposed documentaries, must be taken with a few grains of salt. Editor's Note: see an interview with audio engineer Jason Alberts here.